Birth date : Saturday, January 7, 1967. Birth palce : Jaipur, Rajasthan, India. 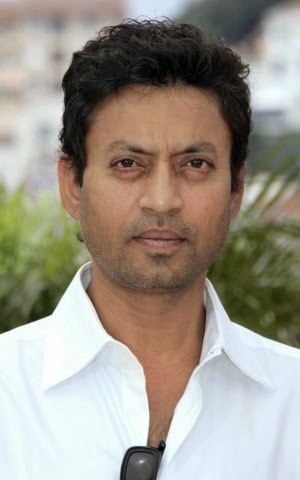 Birth Name : Sahabzade Irrfan Ali Khan. Father's Name : Sahabzade Yaseen Ali Khan. Mother's Name : Sayeeda Begum. Children/s : Babli Khan, Aryan Khan. Albums : Gunday - Teaser. T.v. Shows : Mano Ya Na Mano, In Treatment, Mtv Hero Honda Roadies 7, Kyaa Kahein, Jai Hanuman, Star Bestsellers, Just Mohabbat, The Great Maratha, Chanakya, Bharat Ek Khoj. 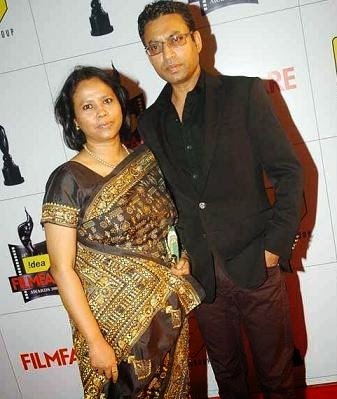 Famous Films : Th Warrior (2001), Kasoor (2001), Gunaah (2002), Haasil (2003), Footpath (2003), Aan: Men at Work (2004), Rog (2005), A Mighty Heart (2007), Life in a Metro (2007), The Namesake (2007), Sunday (2008), Krazzy 4 (2008), Slumdog Millionaire (2008), Billu (2009), 7 Khoon Maaf (2011), Thank You (2011), Paan Singh Tomar (2012), The Amazing Spider-Man (2012), Life of Pi (2012), Saheb, Biwi Aur Gangster Returns (2013), D-Day (2013), The Lunchbox (2013), Gunday (2014). T.v. Adds : irfan khan religare insurance ad, Vodafone latest ad, Vanesa Envy 1000 Deo. Awards : National Film Awards, Padma Shri Award, Filmfare Awards, IRDS Film Award, Screen Actors Guild Award, Nominations- Independent Spirit Award, Nominations- Stardust Best Supporting Actor Award, Nominations- IIFA Award: IIFA Best Supporting Actor. "Irrfan Khan" is a very wonderful personality throughout his film career he played a tremendous role in all fields such as comedian villan hero drama and also in all types of negative and positive roles. He is very honest to his work. Any of his tremendous films when comes in mind all make us happy sad and proud. All his movies makes him a very huge personality. He always did the full disambiguation with all his roles offered to him. He is also very successfull in both his social and his personal life. His name will remains in golden words always in bollywood history.